It’s so yummy that you may want to taste it yourself! I’m guilty of doing that! Fresh blueberries: As much as you can, choose this over those packaged ones. Remember that you can reap more nutritional benefits (and it tastes way better too!) if you use the raw blueberry. The thing about canned fruits is they tend to have more sugar content. That’s not something you want to introduce your baby at an early age especially for those below one-year-old. They might become picky eaters and only eat dishes laced with sugar. Other fruits or healthy ingredients: Always try to balance out the flavour. You can add natural sweeteners such as homemade applesauce, banana or pears. With these, there’s no need to look for more ingredients that can make the puree or baby food sweeter. Besides, adding anything organic only adds to the nutrients that your little one receives. Of course, canned fruits may also be safe for the baby, but it’s not the best choice. Aside from the huge difference in taste, there’s also the issue of shelf-life especially if you’re planning on freezing the puree and re-heating or allowing them to thaw when ready for consumption. Choose the right kind and store correctly. When buying, remember to choose organic. Don’t go for something that has bruises and is quite squishy (these tend to mould fast). Pick the blueberry that’s deeply-colored (brilliant blue shade). After washing thoroughly, you can put them in a bowl with a lid or a bag before storing inside the refrigerator. Or if you prefer, you can toss them in a freezer-safe bag, remove the excess air before putting inside the freezer. Those stored in the fridge have a shelf-life of up to two weeks, but I recommend using it as early as you can. There are several ways you can use this fruit, and one is to turn it into a natural yoghurt. You can do so by just mashing up the fruit. There’s no need to add anything more. If you’re planning on doing this, it would be much better if it’s fresh from the freezer. To make a simple puree, you need one cup of blueberries with a ½ cup of purified water. Bring the water to a boil and slowly reduce the heat once you’ve added the blueberry. Once they’re soft and tender (roughly around 15 minutes or more, if frozen), remove the fruits and add to baby food maker or blender. Blend it out and add the liquid slowly until you’ve achieved your preferred consistency. If you want to add variety or introduce something new, you can add the puree to your baby’s oatmeal. You see, one of the things I realised when I started making my homemade mixture of baby food ingredients is that our little ones enjoy even a little change in the taste. When you want to store the puree for future use or if you want to make a few day’s worth of food, you can let the puree cool and store them in containers. Make sure they’re BPA-free. If you put it inside the refrigerator, it can last up to three days, but for freezers, it can go for three months. Once you’re ready to use it, simply thaw in the fridge. There are other fancy recipes you can try too such as blueberry custard and pancakes. 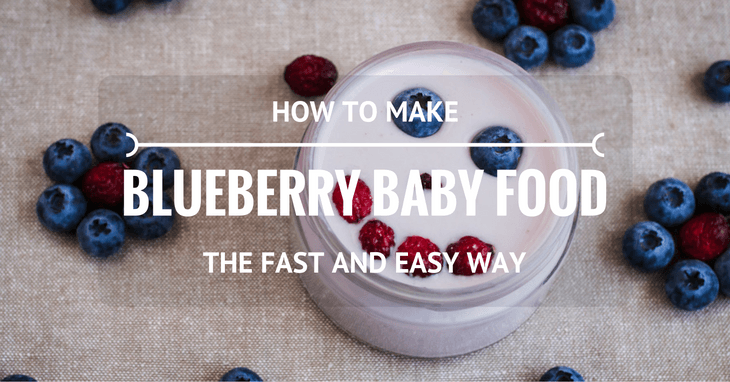 This is one of the most flexible ingredients you can use (don’t even get me started on cheesecakes, LOL) and your baby will love what you’ll prepare. Have fun experimenting in the kitchen because making a homemade baby food is fun and easy and in the long run, it can be more convenient. Also, you know what’s in every dish. Do you have other recipes you can share? Tell us in the comments!